It's true when people tell you that newborn's are hard, because they are -in all their goodness and perfection, they are hard. Cameron truly has been a great little guy, but he's still trying to figure out this world and how to use this body of his. He's happy and smiley and loves to be spoken to, but sometimes all of that is just too much for him to handle. - He is still working on neck/head control, but is getting stronger every day. - Eats every 3 hours. - Sleeps through the night! He falls asleep about 9pm and wakes up about 5am to eat and sleeps again until 9am. Little angel! - He's a little smiler. It's adorable. - Starting to coo more each day. He loves when people talk to him. - Loves his big sister. He looks for her when she walks into the room. - Has strong and skinny legs. He pushes against everything to try and stand. - Cam had a rough go with his shots. His little legs hurt him badly and he screamed pretty hard. But, he's a champ and is now A-O-KAY! Cam, we sure love you to pieces! You're snuggly and sweet in all the right ways and watching you grow has been incredible. You've changed every day since you were born and your happy face is enough to brighten any day. We are learning to slow life down with you around and enjoy the little things - the way your curl your toes or smile at grandpa likes he's one in a million. Thanks for choosing us to be your family! 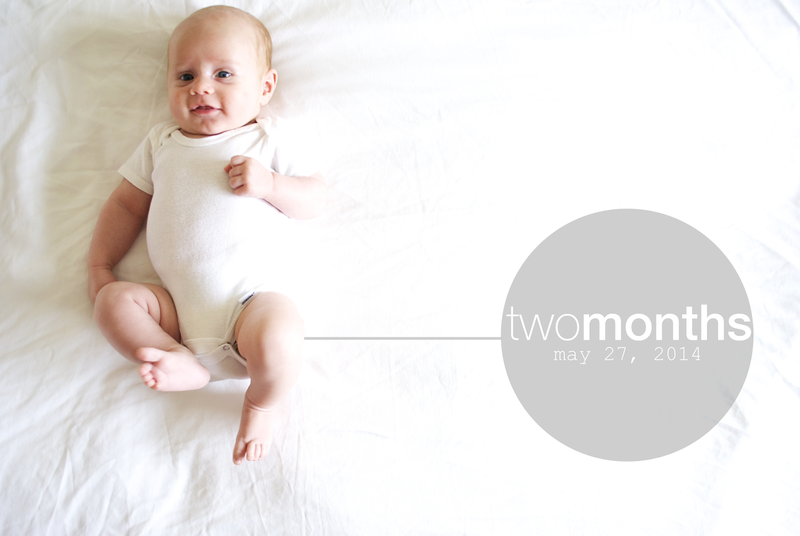 Happy two months! Keep smiling little one.